Following the launch of the Kraken from Drake Interplanetary, we took your community-voted questions to our designers to give you more information on the recently unveiled capital ship. Special thanks to John Crewe and Todd Papy for answering these questions. Do the Kraken’s shields cover other ships parked on the deck? The Kraken’s shields cover the hull of the ship and do not cover the ships or people that may be on the exposed landing pads. Ships contained inside the Hangars are covered by the shields. With the improvements to shield tech coming with Single Distance Field in the future, the projected bubble people currently see will be removed with a more hull wrapping projection of shield energy. What are the Kraken’s refuel, restock, and repair abilities for docked ships? The Kraken is, in many ways, a mobile base. This means it is able to refuel, restock and repair ships that have landed on it but these resources must be taken from the Kraken’s stores. Can you quantum travel while ships are parked on the deck? What about with people on the deck? Yes, you’ll be able to Quantum with ships parked on the deck. Quantum drives in our universe create a little bubble around the ship to move it and protects outward to cover those in very close proximity to the hull. Like other ships in our game, being outside your ship when in Quantum travel is an extremely dangerous scenario, so it’s not recommended due to the slightest misstep resulting in death or abandonment in deep space. 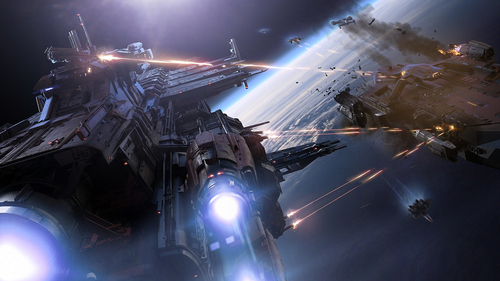 What are your plans for landing on the Kraken while it is in motion? 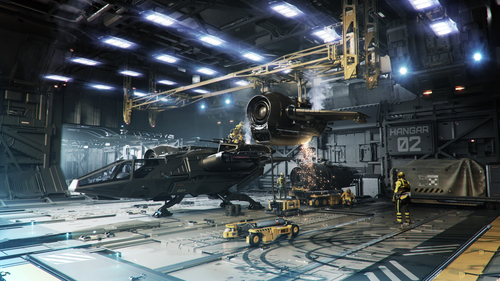 Like the Idris or other ships where you can land whilst they are in motion, we’ll provide automated landing solutions for those who do not wish to attempt a manual landing. This will provide a safe and secure landing at the expense of time, similar to our current automated landings at stations and rest stops. Can you spawn ships from the Kraken? When you spawn your Kraken, you will be able to spawn ships in/on it if you own them, but beyond that point no other ships can be spawned dynamically on-board. It is similar to how the Constellation will be able to have a ground vehicle within when spawned but is unable to spawn another ground vehicle in the hold, mid-flight. 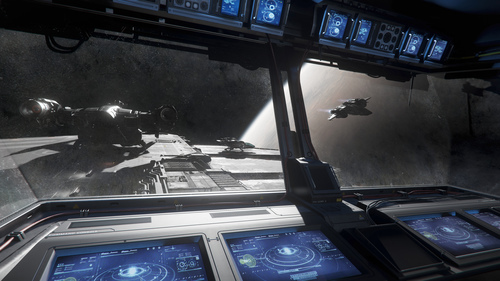 Players landing on the ship during game-play will have their ships permanently on the pad. What happens to the landed/hangar-landed ships if the Kraken pilot logs off/is disconnected? And what will happen when the owners of the landed ships log off? Do their ships persist until the Kraken is despawned, or is the pad free for another one to land on? The Kraken will follow the same rule-set as the persistent bed log off system we current have in game, if the owner of the Kraken logs off and there are no other players on-board, then it will be despawned. If there are still players on-board, then the Kraken and ships on-board will persist. If a player lands their ship on a Kraken, then proceeds to log off, their ship will persist with the Kraken until the point the Kraken is despawned or destroyed, at which point if the player then rejoins they will either have it respawn at the point the Kraken was or have to reclaim it in the event it was destroyed. 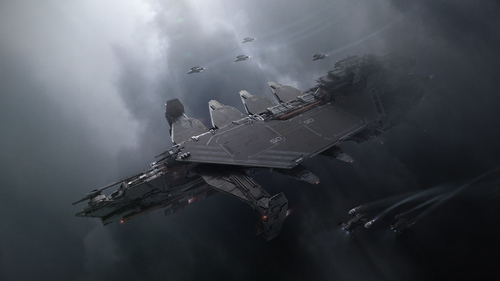 How does the Kraken’s armor compare to other ships in its size-class, like the Idris? In true Drake fashion, the approach to construction prizes pragmatism and cost-effectiveness. Consequently, the Kraken is substantially less sturdy than the Idris and other dedicated military ships that are expected to face direct heavy or capital-scale firepower. What is meant by “Towards the rear of the ship public accommodations can be found for visitors and associates?” Does the Kraken offer any special function or gameplay for public services like shops, bars, medical, or trading for those who are waiting for repair or just visiting? There are onboard accommodation rooms to cover 1-2 players per landing pad. 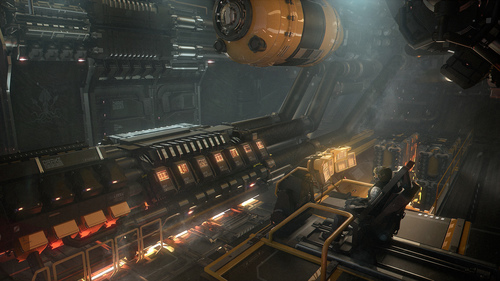 These are basic habs like you’d find at GrimHex and provide somewhere to rest, change, and sleep. There are no dedicated facilities like bars or trading areas on-board at this time. With the Kraken being capital ship size will it have escape pods now unlike other Drake ships? 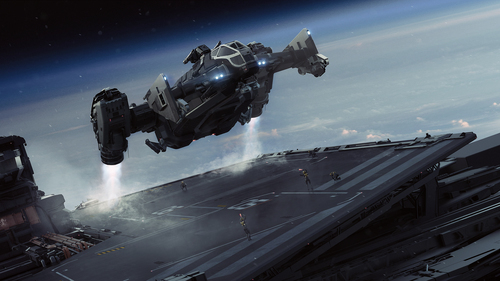 Drake sees no need to provide expensive escape pods when the Kraken can hold plenty of ships to facilitate escape in the “unlikely” event of an emergency. How many ships can the Kraken hold and still quantum drive with? The current design for Quantum Travel requires all the doors to be shut before the Quantum Drive can be initiated, with no requirements beyond that, such as checking for maximum ship amounts. The Kraken can therefore quantum travel with a full complement of ships, although as mentioned earlier, being on deck is a risky proposition. Can the Kraken equip military grade items or only civilian/industrial? The Kraken can only equip Civilian and Industrial items and comes with Civilian Grade C items by default. The Kraken brochure talks about configuring the rear hangars to fit our needs. Does this mean that the Kraken might have some modular capabilities to outfit those hangars to suit other functions like extended medical/S&R or salvage processing? Drake always look to maximize the use of their spaceships, and whilst these rear cargo holds are ostensibly for cargo, there is a significant amount of real estate that could be re-purposed in the future for alternative uses. How will this ship defend against armed boarding parties or other guests who refuse to leave? The internal layout of the ship provides quite a few choke-points from the landing pads, allowing a somewhat organized defense against boarding. There are no inbuilt mechanics within the ship to deal with guests who refuse to leave. That will be down to the owners persuasion techniques. Can we transfer cargo between docked/landed ships? If not, can cargo be transferred between docked/landed ships and the Kraken? Every external landing pad has access to the internal tram route via a loading hatch located within the airlock antechamber. The internal tram is primarily designed to carry cargo between the pads and the main cargo hold of the ship to facilitate cargo moving between ships and the Kraken itself. The Kraken shows some concept of it landed in a desert, as well as parked at Lorville . How can we expect it to fare in atmospheric flight. Does it have VTOL? As with all ships of this size, the atmospheric flight performance can be characterized as poor at best, but the Kraken does have multiple VTOL thrusters to allow it to take off and land in atmosphere. There are two located under the front “ears” that pivot to face 90 degrees down and more are built into the underside of the rear hull in a permanent down-facing layout. Discussion in 'RSI News' started by RSI Comm-Link, 20 Oct 2018.